In the last post, we saw that carbohydrate and particularly sugar intake have been declining in the US since 1999, even as our obesity rate has continued to climb. In this post, let's look at another putative driver of obesity: our fat intake, and especially our intake of added fats like seed oils, butter, and olive oil. Like the graphs in the last post, the data underlying the following graphs come from USDA food disappearance records (not self-reported), and NHANES survey data (1, 2). Also like the last post, the graph of total fat intake is not adjusted for waste (non-eaten food), while the graph of added fat intake is*. As a consequence, the figures for total carbohydrate and total fat intake are higher than actual intakes, but still good for illustrating trends. As you can see, there is no real trend here. Our total fat intake increased slightly between 1980 and 2010, but mostly we just bumped around with no real directionality. 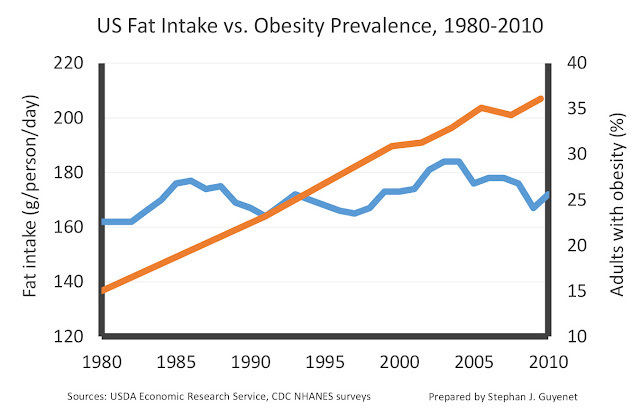 This does refute the common claim that our fat intake declined over the course of the obesity epidemic. 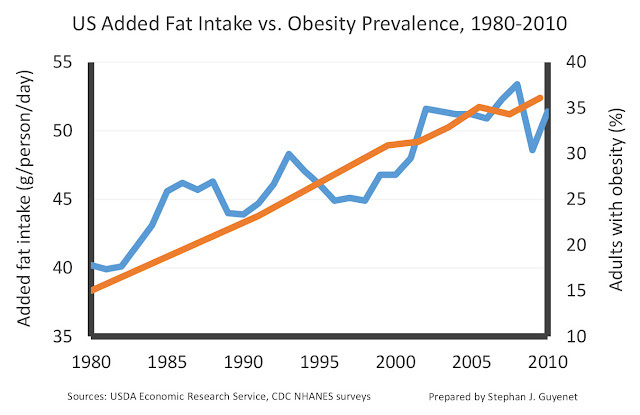 All available data agree that our absolute intake of fat has hardly changed at all. It only declined as a percentage of total calorie intake. Now, let's see what happened to added fat. As opposed to the fat naturally found in foods like meat, nuts, eggs, dairy, avocados, and olives, added fats are those that are extracted from foods and concentrated to a nearly pure state. These include seed oils like soybean and canola oil, as well as more traditional fats like butter and lard, although today we eat much more of the former than the latter. Hmmm. Added fat intake increased by 28 percent over the course of the obesity epidemic, and it's the only factor out of the four we've examined that consistently increased in parallel with our expanding waistlines. Added fat is the most calorie-dense food on the planet. Added fat is one of the most effective ingredients for enhancing food palatability. Added fat has a very low satiety value per calorie. People eat more total calories when extra fat is added to their food. Added fat fattens a variety of non-human species, including mice, rats, dogs, cats, pigs, and monkeys, when added to their food. The rise of added fats was probably a contributor to the obesity epidemic, along with other diet and lifestyle factors. While fat isn't necessarily fattening when it's eaten as part of whole foods with lower calorie density and high fiber or protein (meat, yogurt, avocados, nuts), a lot of research has converged on the conclusion that added fat is fattening. * I did adjust the data for an artifact between 1999 and 2000 that artificially inflates fat intake data after 1999. This was caused by a change in the assessment method for certain types of fats. I'm a little confused. Are Added Fats not counted as part of Total Fat? Strongly ties in with my own personal experience. Fat is not inherently bad and is in fact important for health. But added fats in the form of oil and even the paleo darlings coconut and butter (ok primal for butter) are basically added calories for very little return. I'd rather get my fat from eggs and meat and fish and avocados and nuts, etc. What would it look like if you plotted %obese vs number of households with smartphones? Or %obese vs price of apartments in NYC? I wouldn’t call butter and lard “added fats” as both are fats removed from foods historically consumed in a whole state -- whereas the oils made into margarine and shortening were never part of the human diet until recent times. Almost everything in the “dairy” section of American supermarkets is made from soybeans and/or canola oil. Many Americans have never in their lives tasted butter or whole milk. Criminal. Thanks for posting this series, Stephan. It's fascination, as I've come to expect of you. A question: iIf obesity has gone up while overall fat has stayed steady and carb and sugar consumption have gone down, that seems to indicate that increased protein consumption plays a big factor. Is that the case? Mehdi. You are not confused - you are correct! If total fat shows no trend, and added fat increases and tracks obesity, then reducing "natural" fat presumably leafs to an increase in obesity. This is true if, and only if, the reasoning of this article is correct. But I don't think it is. I think the scaling of the graphs is very misleading, and there is no causality involved here. Here is why the work of Ray Peat is so important. The so called "added fats" are mostly PUFA, coming from seed oils, not from butter or coconut oil. High PUFA intake induces metabolic disorders. Do you have a graph for added sugars? I would expect it to be similar. So the answer comes out - avoid processed foods. According to those graphs, total fat consumption increased by about 10g/person/day between 1980 and 2010, and added fat consumption also increased by about 10g/person/day. The graph slopes look different only because of different vertical scales. In other words, the same increase that you dismiss as inconsequential with respect to total fact you identify as critical in added fat. I see no reason to think that 90 kcal/day is not 90 kcal/day, period. Interesting look at trends in the last two posts. I really think you need to cover the recent Cell paper. I still think lack of movement is a big deal in all of this. I'm not talking running for hours, I'm talking taking the stairs four floors. Walking to the grocery store, etc. I've moved around the US a lot, and I've noticed that areas where people walk a they are also skinnier. Colorado, lots of walkers. The overweight people there tend to be transplants. D.C., lots of walkers (breaks across educational bounds here. Lots of PhDs and lots of high school only). Seattle, mixed bag. Vancouver, BC, lots of walkers. Huntsville, not so much. The last one also has a large amount of added fat. Also, CHO. Bread it and fry it. It's a state motto there. In the end, I think sugar, fat, and starch all play a role in common obesity. I just don't think any one of those alone is enough to fully explain it. That's my only point with the CHO and sugar graphs. I doubt protein plays much of a role; much research suggests it's the least fattening macronutrient. OK, I added a best-fit line and it is still consistent with your idea: roughly a 10 g increase both for total and added fat. So this suggests that added fat intake didn't displace other sources of fat during that time period, but rather it added to them. I think you're right about movement being a factor. Phil, I added a note to the post to incorporate your point. I'm not saying that protein causes obesity, though an April 2015 article in the Clinical Nutrition Journal gives me cause for concern in that regard. Too much protein adds calories to our diets. And animal protein tends to be denser in calories per portion than vegetables, it's possible that the current belief in some circles that one can eat as much meat as one wants and not gain weight is harmful to health. I understand that sugar, fat and starch all play a role in obesity. And, since the amount of sugar and starch have been decreasing while the amount of fat has increased, but at a slower rate than that of obesity, there is only one other macronutrient, which it seems we may be overeating. Then add the latest research that found soybean oil to be obesogenic and you have a nice recipe for obesity. Teech, could you offer a source? Does the research state that soybean oil causes more weight gain compared to other oils or that if added to the diet does so? My question is this: Can you describe which foods that Americans eat which are the major sources of these added fats? Chinese food? Sports Bars? Fried chicken? The consumption of veg oils started to go mainstream in the 1920's. And it isn't just the O-6 that are bad - all of the PUFA's are super oxidizable compared to MUFAs and SAT-fat and account for significant increases in oxLDL - the bit that fires up the immune system that causes CAD and screw up insulin sensitivity while they are at it. If you haven't read about the effects of PUFA on the mitochondria you should catch up - there has been a huge amount of new information over the last years. The over consumption of of PUFAs produces inappropriate insulin sensitivity - (you need a bit of lowered insulin sensitivity at night in order to lose weight) (insulin regulates the net flux of fatty-acids that enter fat cells). Eat PUFAs and yes cholesterol goes down with the increase of fat storage - all is well until people stop getting fatter. At that point their cholesterol goes back up - their blood pressure is elevated - heart is working extra hard - they are sicker - not healthier - they have been measuring the wrong endpoints. If you look at the obesity worldwide it is even in poor countries where food is scarce. At first I thought is was due to just the sugars and carbs - but the demographics don't quite show that. If you add in the switching to cooking with vegetable oils instead of animal fats - you now have the perfect conditions for the obesity pandemic. Excess hunger produced by the PUFAs and carbs to fill the calories. So if you eat excess PUFAs - you now have inappropriate adipose insulin sensitivity - calories are stored - now hungry so likely to eat fructose containing sugars to spike the trygly and now the fat cells have plenty to store. Now if you try to go on a diet? Your body will catabolize protein instead of liberating fats because of the PUFAs. What if you want to REDUCE your appetite? Yeah - that matters if you want to lose weight. Eat sat-fats in place of PUFAs where you can. The consumption of PUFA as healthy was promoited by corrupt bits of government sponserd so-called science. Luckly science is self correcting in the long run. BTW - I've seen other numbers that show a 5x increase in PUFA consumption starting in 1960. I find this to be a bit too simplistic, although informative and interesting. Perhaps, I was not following your blog well enough, and maybe I am not getting the context. But how have the caloric intake (& expenditure, to account for the movement) changed? And how should we account for metabolism-related epigenetic changes, as one commenter already mentioned in the previous post, I believe? Could the effects of the diet changes become observable only after a certain lag period? Other sources of metabolic havoc would include stress, and how have its levels changed in the same time period? Would distribution of data affect the outcome (e.g., fewer people eating more carbs, etc.)? All this goes for a very complex picture, and as you have said it yourself, no one answer will be sufficient. Big respect for your work, and thank you very much! Teech is right that some studies have found soybean oil to be more fattening than other fats in rodent models. It's not clear why; my guess is that it's at least partially attributable to the fact that it's liquid at room temp and is more palatable than solid fats in the context of a rodent pellet. I find the overall lit difficult to reconcile with the hypothesis that too much linoleic acid is to blame, even though you can find specific papers that are consistent with that hypothesis. Thank you Stephen for the references. What I take from the abstracts is that for some breeds of lab rats that don't exercise, soy oil can cause greater weight gain than other tested oils, but that linoleic acid is probably not the contributing factor. I find it interesting that glycemic load was ruled out as a factor. While this is suggestive enough to warrant human research, I don't see how it relates to the discussion. What if we're looking in the wrong place for causes of obesity? Thanks for continuing to post thoughtful, up-to-date research and analysis! I have been thinking a lot about fat in the context of whole foods versus "added" processed fats. From a personal perspective, if I were to try to get all of my fat from whole foods like olives and avocados, I would have a harder time maintaining a healthy weight than if I also use butter, olive oil, etc. (Fast metabolism, active lifestyle, digestive struggles, etc. all play a role for me.) If someone is genetically disposed to high cholesterol, eating their fat in the context of antioxidants and fiber may become even more important than it is for the average person. I also find that people eating a mostly vegan diet might need higher quantities of added fat because they are not getting any from animals. I also like to consider eating locally whenever possible--collard greens cooked in butter is a lot more local for me than avocados or olives. This article seems to imply that olive oil, grass fed butter, pastured lard, coconut oil, pastured tallow, avocado oil, are all obesity inducing, since they are all, clearly, added fats (and all are processed foods too). That is not good. I believe that most of the added fats that Americans have been consuming more of are seed oils. American's started replacing animal fats with seed oils because lipid-heart hypothesis. Stephan has several articles where he discusses their possible role in obesity. Hi Stephan, thank you for a great post and blog! I find your arguments regarding the connection between food reward/palatability and the obesity epidemic compelling (not just this post but the blog as a whole). However, I feel that there is a lack of epidemiological/observational studies on the topic. Are you aware of epidemiological studies specifically investigating the role of food reward/palatability in weight gain? I think such studies are/would be important as to demonstrate that food reward is also relevant outside of more controlled experimental settings (i.e. in free-living subjects over longer time-periods). The closest thing I have found are some recent studies (using the categorization of the Brazilian dietary guidelines) investigating the association between "ultra processed foods" and weight. Do you think that the concept of ultra processed foods overlaps well with food reward/palatability? How many thousands of years have butter/ghee, cream, cheese, lard/schmaltz/tallow, fish oil, coconut oil, coconut milk, palm oil etc been consumed? Amazing that many people can not accept that fat, which is 9 calories per gram would cause more weight gain than carbs which are 4 calories per gram. Not to mention it's more easily stored in our fat cells whereas glucose has to be converted to fat ( a very rare and inefficient process - de novo lipogenesis). And just from a calories in and out perspective a higher fat diet would be higher in calories. That's why paleo and low carb diets have such small portions. And whenever they talk about donuts and cookies they treat them as carbs when there are really high fat products. Then they want to eat animal products to absorb the protein, iron and calcium but somehow the saturated fat and cholesterol magically doesn't get absorbed. But people love to hear good things about their bad habits as the saying goes.